Posted By:Unknown | At:5:11 AM Be the first to comment! It's not like we needed another reason to love Michelle Obama, but she decided to give us another one when she showed up at the 'Target' in Alexandria, Va to shop. Even in a baseball cap and some shades, the lady continues to make me proud. 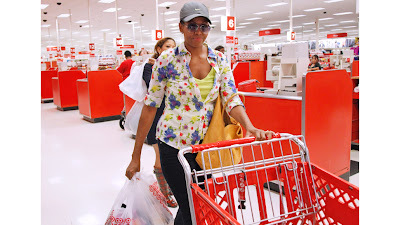 WASHINGTON (AP) — Attention Target shoppers: You could have been standing in line with Michelle Obama. The first lady, hard to recognize in a baseball cap and sunglasses, shopped Thursday at a Target store in Alexandria, Va., just outside Washington. Casually dressed Secret Service agents arrived about a half-hour before Mrs. Obama, who walked in through the main entrance with an assistant. She spent 30 to 40 minutes shopping, pushing her own cart. She apparently was recognized only by the cashier who rang up her purchases. Since coming to the White House, Mrs. Obama has lamented missing out on what she calls "normal stuff," like Target runs. She isn't the first first lady to try to go out unrecognized. Hillary Rodham Clinton went for walks wearing a baseball cap and sunglasses, too.